Great Moments in Mets Sadness: Carlos Beltran’s bat slumped on his shoulder, his knees made of pink slime; Doc Gooden lost in a crack house while his teammates celebrated a World Series in the streets; Luis Castillo’s too-early pop-up squeeze; Bobby Valentine’s Groucho Marx routine; “A really good kid. A very good player. Not a superstar.”; Dykstra-for-Samuel; twin collapses in ’07 and ’08; the Madoff follies; Kazmir-for-Zambrano; “The Walk-off”; Vince Coleman’s firecrackers; Mike Scioscia’s heroics; Oliver Perez’s left arm. The Mets — and their convulsive, overreacting, gallows-humorless fan base — thrive in a culture of ignominy. It’s bad, or it’s going to get bad. Despite two World Series wins and a surprising long-term profitability in the Land of Yankee, the Mets will always be baseball’s drunk uncle, prone to moroseness and pratfalls around the coffee table. Even in victory, there’s weakness. The 1969 Mets were the product of a “miracle.” The baseball-dominating, 108-win 1986 squad has been branded by Buckner Ball historicity and disappointment in the non-dynastic years that followed. The saddest of these sad stats: Across a 50-year pitching-rich existence, the absence of a no-hitter. That’s over now. Eight thousand and nineteen games later, it’s over. Johan Santana did it. Friday night against the St. Louis Cardinals, then the National League’s best-hitting team, Santana turned in a truly Mets-ian no-hitter, which featured five walks; an awkward game-saving, concussion-inducing catch by Queens hometown hero Mike Baxter; 134 pitches, just 629 days after career-threatening shoulder surgery to repair a torn anterior capsule in his left shoulder; a blown call on a clear foul line-strafing liner by former Met Beltran; and did we mention it was a no-hitter? The Mets have a no-hitter now. The last of Seaver’s Mets one-hitters came against the Cubs on April 17, 1977. In the fifth inning, Mets catcher John Stearns thought Seaver had Cubs third baseman Steve Ontiveros struck out, but umpire Andy Olsen called the pitch a ball. On 3-2, Ontiveros hit a bloop to right field, for which Ed Kranepool dove, but missed by inches. This is not to discount the rogue’s gallery of mutts and geniuses, identified by Cousin Sal earlier this year, who went on to throw no-hitters after leaving the Mets, including Seaver, Doc, Cone, Ryan, Mike Scott, Hideo Nomo (before and after joining), and — just this season — Philip Humber, who was traded in 2008 for, you guessed it, Johan Santana. So this was a long time coming. I am New York native very recently transplanted to Los Angeles for all the milk and the honey and the humidity-free climate, and I’m coming to grips with a Giant Apple–shaped hole in my heart. I’m going to catch some games by the fifth or sixth inning after scurrying home from work like I did Friday night. But until life settles, I depend on the Internet. On Friday, Twitter told me Santana was carrying a no-hitter through six. Ho-hum. I rifled through the 11 available sports channels in my temporary residence, but didn’t find the Mets. I began following pitch-by-pitch on MLB.com. I fretted as text messages started pouring in. “Are u watching this?” Sorta, Dad. I attempted to sign up for MLB.TV to no avail. (How can I have a password for a service I’ve never signed up for, MLB.TV robot?) I sought advice on downtown Los Angeles sports bars. And secretly, quietly, without acknowledging it anywhere, I hoped it wouldn’t happen. Not without my eyes on it. The pitch count crept quickly after a walk-heavy first four innings. Mets manager Terry Collins agonized over whether to pull Santana, arguably the most important player on a surprising contender. I agonized over whether to make a run for it, fearing that my departure, with sentimental hope clashing with selfish desire, would jinx the no-hit bid. After a relatively breezy eighth inning, my wife and I decided to make a move. We settled on The Down and Out (fitting) inside the Alexandria Hotel and began racing through the streets, dodging bus stop stragglers, homeless people, small children looking for their parents, and gigantic L.A. debris. First entry was denied by a locked door. At the next door, a bouncer scanned my ID. My wife, faithful companion and confused non-baseball fan, forgot hers. No magic for her. By the time I entered, I found that this bar, a sports bar, had not turned to the game. With the NBA playoffs in swing and the Dodgers at play, there was no reason to do so, assuming you hate history. I begged a bartender to find the MLB Network. Three minutes later, he found it on the TV’s guide. Then he turned to me and said, “Ah, it says Tigers-Yankees, looks like you’re out of luck.” I responded, “NO BRO, TRUST ME, THE GAME WILL BE ON. THEY HAVE NEVER HAD A NO-HITTER. DO IT NOW.” So he did. On the screen, Johan Santana came set. He threw a low, sweeping pitch. Swing and a miss from World Series hero David Freese. Cut to Santana, who pumped his fist, then again. 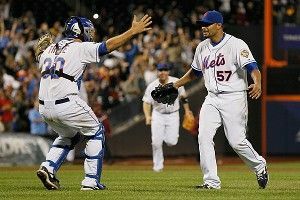 Josh Thole surged from the backstop to hug Santana, who kept screaming “Come on!” at the young Mets catcher. They did it. The board went up at Citi Field: No-Han. All I saw was that final pitch. Even I couldn’t jinx it, because jinxes don’t exist. This happened three days ago, when the Mets were five games above .500. This weekend, they allowed just one run across three games to the slugging reigning champs. Knuckleballer and gifted memoirist R.A. Dickey, who shut out the Cards on Saturday, is having an All-Star-caliber season. David Wright is hitting the ball hard and in places where they ain’t again. The team is leading the league in runs scored with two outs. People named Kirk Nieuwenhuis, Jordany Valdespin, Vinny Rottino, and Jeremy Hefner (not the lineup of One Direction) are making surprising contributions. They’re 16-6 in one- or two-run games. And they’re in a three-way tie for first place in the NL East, arguably baseball’s most competitive division. Also, they got a no-hitter. How Did the Heat Botch Their Final Possession?